Another lively PAC meeting was held this month. Here are the minutes so we can all stay up to date. • Important to define what bullying is and is not. • Grant money has been made available and so our school is partnering with the community center with some anti‐bullying activities to educate people about sharing, caring and building a safe community. Hoping to include businesses, First Nations, politicians, police, etc. • Pink shirts for a week (1000 pink shirts and window decals will be ordered) Demonstrates that we are a “community of kindness." Shirts will be sold for $1.00 which will go towards a rally at the community center. • Kim Thorson, owner of Ross Bay preschool is collecting hampers for our school, which will be distributed by the Administration. Coverage by Chek TV. Joe will bring the topic up at January’s PAC meeting once he knows better what support he needs. Amy should feature Kim Thorson on our blog (also Thank You card?). • Still not received the quote for the message board. I will follow that up this week. • Emailed the TD bank manager requesting a meeting in January for corporate fundraising ideas. Carolyn will update PAC once she hears back re: message board and corporate fundraising. • BCTF presentations have been booked. Anti‐bullying workshop will be Feb 7th, 2013. Raising Confident Boys and Girls will be April 11, 2013. Both workshops are being provided, free of charge, by the BCTF. The presenter is Benula Larsen. Each workshop is approximately one hour long. • Monthly Exec Meetings‐ It was agreed by the exec that regular monthly executive meetings would be helpful. Proposal to have them the week before (on the Wednesday) the regular PAC meeting. Thoughts? Vote? Outcome: Yes! Wednesday January 2nd…where? • Louise Alvarez ‐ I spoke with Louise about her request for scrapbook money and informed her that we have a policy that her consumables are spent before she asks for more money. She was agreeable to this and will request again in the spring. • Patti Parkhouse had asked the PAC and the school if we were interested in providing a letter of support for the Banfield Orchard. Approved by exec‐ letter was written (thank you Carolyn!) and provided to Patti. Joe also wrote a letter of support. Patti very appreciative of the school and PAC’s support. • Media Contact List has been created and distributed to the PAC exec (but available to anyone who wants it) for promotion of PAC events/request etc. • VCPAC Conference in Feb 2013 ‐ it has been confirmed that our PAC will receive two free tickets to the VCPAC conference in Feb. If there are more than two of us who want to go, we should consider sponsoring the others, as parent education is important. Please note: I (Mercedes!) want to go!! • Bulletin Board ‐ I started the Bulletin Board take over (Shelley made up the PAC sign and I covered it in blue). I haven’t been able to make it look more fun/fancy yet, but that is coming and I am open to (and welcome) help/suggestions etc! • Christmas Concert‐ need help with collecting cans of food and donations for Mustard Seed (maybe a couple of people to be there before concert starts‐ 5:45 or so?). We will also need some big (but not too big that we can’t carry if they are full of cans) boxes, gift wrapped to look nice for the concert. • Met with Lisa Helps re: 4 way stop in front of the school. Lisa is talking with the city traffic people. Margaret will wrap up boxes for Mustard Seed collection and talk to Shelley to clarify the rules of the sale (4 items per child). Amy will call BBBS to see if they will pick up the left over items if George Jay doesn’t want them. • VCPAC meeting was on Nov. 27th at Braefoot Elem. • Conference happening on Feb. 23rd at Spectrum and will cost $70 before Feb. 1st and $90 after. • Colquitz Middle School wants an increase to the playground budget and will be sending a letter to the District. Cloverdale to follow. The letter will be arriving shortly for us to review and then possibly send in support. • Wifi research is continuing and then will be sent off for an “internal process” in Jan. & Feb.
• The French Advisory Committee is recruiting (would like to include parents from the English stream)—anyone interested? • The PAC webpage has had 738 page views (2300 since inception) with the most popular posts being about Constable Matt and the student’s art. • Please let Amy know if you have any ideas for blog posts. • On Feb. 1st there will be a provincial funding announcement – will be asking for school boards to pay for 1.3% of the teachers’ pensions. Meeting on Feb. 6th to discuss. • Jaime will lead the campaign again next year. Thinks that it is worthwhile. Would appreciate parent help. • Went well. Chooses products rather than funds. Examples: novel sets for library, carpets and books for teachers, etc. Conan and Mercedes need to talk to the Executive about the next steps with regards to the classroom earthquake Kits Required Replacement Inventory given to us by Joe (see attached pdf). • Erin McTaggart, a Student Teacher in the Grade 3 class, will teach a lesson on plant growth in the rain garden in February. Mercedes and Margaret will thank Noreen Nash. Our annual PAC Christmas sale was a huge success! Our main goal with this event was to provide children and their families with an opportunity to shop for inexpensive pre-loved items to give as gifts. It was a pure delight to see so many school children in the gym dithering over their selections in order to bring home the perfect gifts for their loved ones. The spirit of giving is alive and thriving at Vic West Elementary School! Our secondary goal with the sale was to raise some funds that ultimately go back into our school. Success was achieved on that front too as the final total raised was just under $881! and anyone else who, in big ways or small, made a contribution of time, treasure or talent to our Christmas sale. Time, Treasure and Talent came together in a big way! A warm, welcoming smile is often the first thing people find when coming into the office at Vic West Elementary. 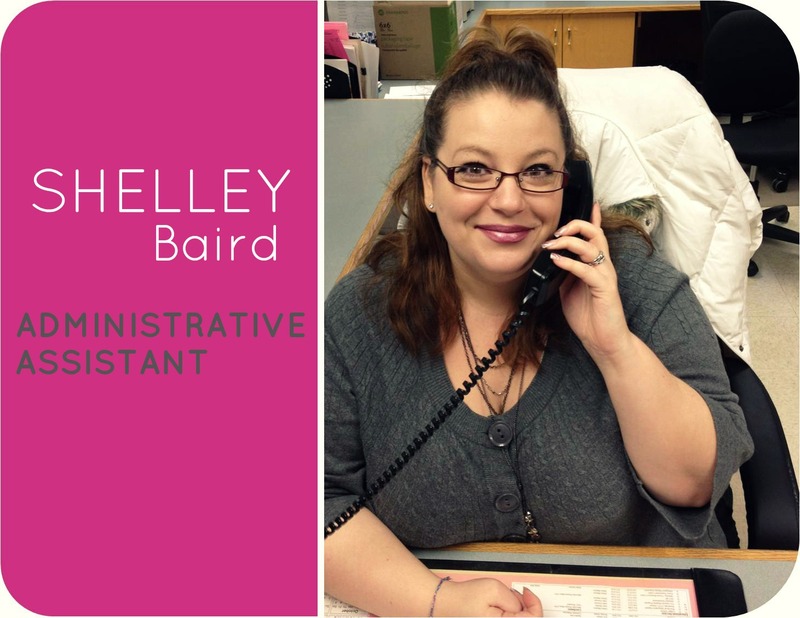 Administrative Assistant, Shelley Baird, loves her job and is a valued friend of the Parent Advisory Council. Whether it's getting the word out to parents about school events, taking parent phone calls when our kids have a sick day, or designing our lovely new bookmarks (pop into the office to get one! ), Shelley plays an important role for families at the school. Shelley kindly took some time to tell us a bit more about what she does and why she loves it. 1. What is your favourite thing about your role at our school? Well this is my third year here at Vic West and I would have to say the obvious answer: THE KIDS!! I get to be a part of their day and they get to equally be a part of mine (not that everyone is out of class all day long lol). The feeling you get when you walk into a classroom and hear 16-20 kids yelling your name makes everything worthwhile. For me, I get to be a part of every community we have here in the school; the staff, the parents and the students. I get to come to a job everyday where I am a part of something and it makes me feel really good. 2. How do you hope parents and students feel when they come into the office? I hope that everyone that enters the office from the staff to the parents to the students feels warm and welcome. I have 2 children of my own that attend school and it is important to me that they feel supported and welcome at their own schools. For me, it’s an automatic piece of the job…I know what it’s like for parents to be away from their children all day and vice versa, and I think it’s really important that both the parents and the children feel good about where they are spending their day. 3. What is the first thing you do in the morning when you arrive at the school? The first things that I do in the morning when I get to school are to check the phones and see who will be absent or late for both the staff and the students. Then I am at my desk taking all of the phone calls about mostly the same thing and fielding any questions that people may pop in and ask. The morning is the time that I sit and make sure that we know what the day is going to look like and we can anticipate any surprises before they happen. 4. What's the last thing you do before you leave? After the students are all gone home for the day, this is the time I spend working on projects that I don’t necessarily have time to get to during the regular parts of my day. Things like the Vic West monthly newsletter or the website. The last thing that I do at the end of my day is to check in with the supervisors to make sure that all students have gone home safely. Then I spend some time getting things ready for the next day and tidying up my desk so that when I get to the school in the morning it will be ready for me to begin my day organized. 5. When do you feel the most proud of Vic West Elementary School? That is such a hard question to answer because the truth is I am always proud of Vic West! My favorite thing is when people ask me where I work because I get to tell them all about the wonderful place I get to come to everyday. I’m very passionate about the school and I feel so privileged that I have ended up with a job that I love to come to. The Vic West community of staff, students and parents are an amazing group of people who inspire and encourage me every day. A passion for reading starts at home. And magazines totally count, if you ask us! Here's an exciting opportunity for families of Vic West Elementary School! Trek Victoria Pro City and Central Middle School are doing a drive to match kids in Greater Victoria, from toddlers to teens, with FREE gently used bicycles in time for Christmas! Please submit the above information to our school's Youth and Family Counsellor, Emily Stark at estark@sd61.bc.ca or by phone at 250 382-9131.